100 ton gantry crane is a kind of heavy duty gantry crane for heavy loading material handling operations. 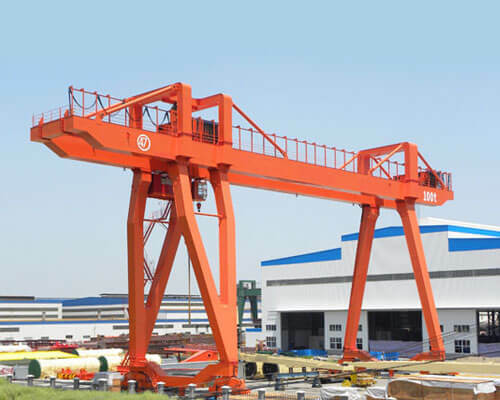 We can manufacture different types of gantry cranes, such as A-frame and U-shaped cranes. The 100t gantry crane is a latest brand new gantry crane with our latest research and development results with structural design. 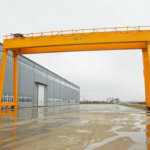 With hoist trolley installed on the two beams, crane legs supporting, and horizontal rails attached to the crane floor, the latest manufactured gantry crane 100t can perfectly integrate with your industry fields, such as your warehouses, logistics and wastes distribution centers, which will promote your business working efficiency to a large degree. 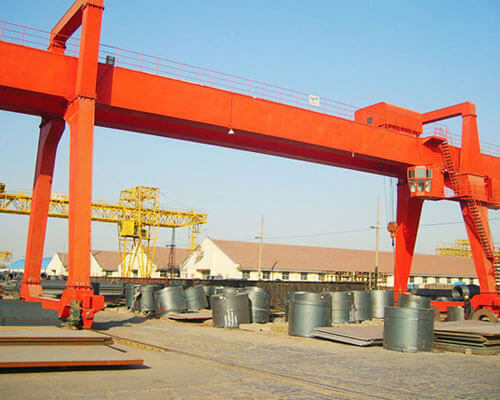 Besides, we offer goliath gantry crane, half gantry crane, mobile gantry crane, and gantry cranes with different capacities from light-duty cranes such as 1t to 10t to heavy loading ones from 10t to 200t. The 100 ton gantry crane can be customized to suit varied needs of our customers. Since clients’ warehouses or workstations are different from one to another, thus the gantry crane can be tailored according to your crane application fields. Different kinds of working environments for the gantry cranes 100t need different configurations in specifications. 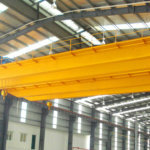 The crane span of the 100t gantry crane can be best configurable for your facility. Equipped with heavy duty material handling gantry crane 100t for your industry, you can lift materials anywhere available for your facility. 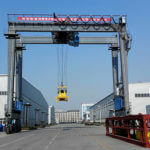 The mobile gantry crane will totally meet your requirements with its high adjustable performance. Leading technological outcomes have been widely employed in our 100 ton gantry cranes, which enable the crane can make localized handling operations easily and exactly. The gantry crane can also be operated in over machines for maintenance and pulling the product. With high stability crane system configuration, the double girder gantry crane enables your crane operators to make operations on any infrequent bases. 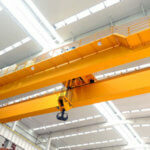 We can tailor different types of cranes totally for your own business application. The 100t heavy duty gantry crane with double girder also be customized according to your individual requirements. The following customized 100-ton mobile gantry cranes just for your reference. If your crane gantry 100t will work in a high safety requirement working environment, such as the steel mills, coal mines, you may choose a heavy-duty crane with higher configurations in the crane safety system. Then you can choose electronic control and wireless remote control system to record the status of the hoist and crane. The anti-collision sensor, anti-sway system will forge a better and slothful operation environment increasing your crane safety parameters. If the loading materials are too complex and you want to know the status it, then load display indicator can help you out with this little confusion. More comfortable crane operators’ working environments just depend on your choice. For any kind of gantry crane, we provide two types of cabins for your operator: one is the mobile operator and the other one is the fixed one. With storm lock and flood light configuration, your 100t gantry crane operator will be more clear when to pirate the gantry crane and avoid operations in the unsafe and security operation environments. Technical specifications for gantry crane with double girders 100t of the above terms just for your facility, any special needs, be free to contact us. 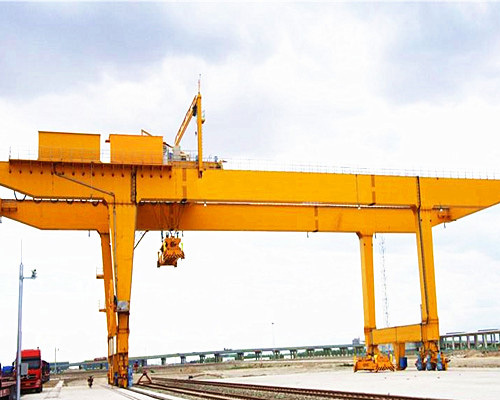 Both fixed gantry cranes and mobile gantry crane are available to you. 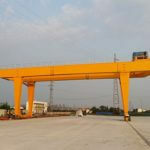 Gantry crane manufactured from our crane factory are all at the lowest charges since you make the crane order direct through our own factory, no third party suppliers involvement. We are making wholesale 100-ton mobile gantry crane activities right now. 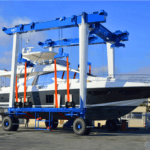 And the mobile gantry cranes, such as the travel lift mobile cranes, straddle carriers, marine travel hoists, all types of theses port cranes or industrial cranes will share a crane discount.